Smartline was established in 1999 with the simple goal of building Australia's best mortgage broking business and putting people, rather than banks, in control of their loan options. Sam Ghoreyshi is a personal mortgage adviser, managing a team of nine and working across mortgage broking, financial planning, tax accounting and investment property advice. After over a decade in the business Sam and the company, as a whole, focus on delivering premium customer service – lawlab have helped them enhance this. It was through the Smartline head office that Sam was made aware of lawlab's revolutionary software – likened to the concept of social media – Rundl allows clients and stakeholders to communicate in one place, upload and capture documents. "We have clients all over Australia and spread across the world throughout Singapore, Malaysia, United Arab Emirates and the United Kingdom. Given the breadth of locations clients and stakeholders can extend to at one time, Rundl consolidates all our information in one place, making communication much more efficient and easy." "We've been given access to a new communication tool that's allowed us to stay on top of all parties and know where everything is at without having to keep chasing up stakeholders." Sam outlined how the process of purchasing a property can be very stop/start in Australia. Clients often put pressure on brokers and banks to get answers and it's very rare for a deal to go through smoothly because of all the different components playing against each other. "As a whole the property purchasing system in Australia is one where there is a lot of disconnect between all the different stakeholders. Everyone has their own vested interest and no one communicates." Relationships between the client and all parties involved can be jeopardised through lack of transparency and clients simply not knowing what's going on. Communication is key but traditionally hasn't always been the easiest tool to master in conveyancing. Sam says clients are often left frustrated and annoyed when the process of purchasing is delayed because one party hasn't responded to an email or answered a phone call. 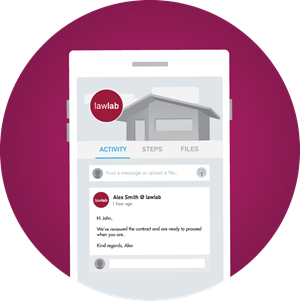 "Moving tasks from one stage to the next, without having to hand hold, is something lawlab have made all the more simple. There's no need for chase-ups and multiple phone calls as all parties have insight into where the process is at and are across anything that's holding it up." Sam likes to use solicitors that are highly proficient in property law but says finding lawyers that aren't sub-standard and overpriced is not an easy task. "We've found that many lawyers charge for premium work that isn't necessarily premium. For instance clients of mine bought a 400k property and it cost them in excess of 2.5k in legal fees. We don't refer them anymore." Open ended fees and non-transparent services contribute to difficulties Sam's business has experienced in trying to find high quality conveyancing services. Through their lawlab experience so far Sam has seen a number of positive results through employer, stakeholder and client satisfaction. "The process of facilitating a property purchase was much more stop and start without Rundl – now everyone can be kept in the loop without making a million phone calls." Sam has found lawlab's Rundl, a cohesive tool that allows all parties access to the deal and provide input and insight. The entire team are signed up to Rundl thanks to lawlab and Sam says staying up to date has never been so easy. "Everyone can see communication come through in real time. This means if one of the team members miss anything, someone else can pick it up and respond immediately. The time we're saving frees up valuable days where we can consistently improve quality of service and ensure clients are always happy with what we're delivering." Sam said lawlab have been really responsive with all requirement and as a result they've been able to build up a great system for referring clients. Through lawlab Sam has been able to introduce clients to a new way of doing conveyancing. The process educates and re-educates all parties on the process by providing an insight into the role every stakeholder plays in the conveyancing practice. "We are introducing clients to a new way of doing conveyancing. The main thing for the client is knowing what's going on. lawlab make this possible 24/7." Sam added that from an internal business perspective they are finding lawlab's fixed pricing system beneficial to planning and budgets. The fact that you can upload/download documents and there's a conversation history you can follow has been critical to changing the way conveyancing is traditionally done. Getting documents signed and through is so important in the process. Rundl really helps from a communications tools perspective – allowing for transparency and a timely turnaround of all relevant documents. lawlab have the 'right' property lawyers who communicate 24/7, providing us with information and keeping us in the loop. Continuing this standard of resourcing will be instrumental as the company grows. Buying a property is already a stressful period for purchasers. Sam says clients are finding the majority of the 'unknown' that goes on behind the scenes is taken out of the equation with lawlab's help. Sam is always trying to get feedback from clients on experiences so as to deal with everything to the best of their ability going forward. Overall, client expectations are evolving and lawlab are matching, if not exceeding, these changes. "Traditionally client's perceptions have been that the only way to get the best service was through face to face meetings with all parties involved in a sale – this is no longer the case." Sam added that people are becoming more and more comfortable with doing business online. important documents. As technology evolves so to do client expectations." We can offer you practical, efficient and expert legal advice on your purchase. Please call us on 1800 529 522 or email conveyancing@lawlab.com.au. Disclaimer This information is general in nature only and does not constitute legal advice. Lawlab accepts no liability for the content of this information sheet. You should obtain legal advice specific to your individual circumstances. Lawlab's liability is limited by a scheme approved under Professional Standards Legislation. Legal practitioners employed by lawlab are members of the scheme.